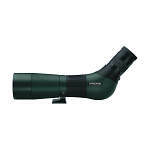 Swarovski spotting scopes are known for putting top optics in very lightweight packages. 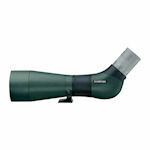 The 65mm Swarovski scopes are a favorite of birders and hunters who require premium scopes on long treks. 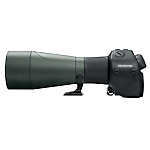 Their 80mm scopes are among the top choices for digiscoping, thanks to their easy to use camera adapters. All Swarovski spotting scopes are waterproof, nitrogen purged, and rubber armored for excellent durability. ATX/STX spotting scopes are Swarovski's revolutionary modular scopes. Mix and match the eyepiece/prism modules and objective modules to make a complete scope, or to supplement a combination you already have. Each module is completely fog- and waterproof. Swarovski ATX/STX scopes are superb for digiscoping too. Swarovski ATS/STS HD spotting scopes are high-quality scopes featuring either 65- or 80-mm objectives lenses and available in angled or straight models. Featuring premium quality HD glass, the ATS/STS scopes use the 25-50xW and 20-60xS eyepieces, which are purchased separately. ATS/STS scopes are made of aluminum alloy frames and are completely fog- and waterproof. Swarovski ATS/STS Spotting Scope Kits include a body (ATS or STS with 65mm or 80mm objective) and an eyepiece (either 20-60x or 25-50x). Swarovski STR Spotting Scopes add a ranging reticle (select either MRAD or MOA body when you place your order) to your view for estimating target distance. 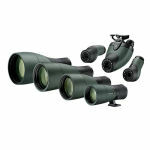 They are available as body only or as a kit with either the 20-60xS or 25-50xW eyepiece.